Containment Protocols: RPC-502 is to be contained in a blast proof metal container that measures 120 cm in length and 25 cm in width. The container should only be accessible through a five-digit keypad entrusted by Dr. ████████, and a few within the Research and Containment Department. Onsite personnel should be equipped with sound-proof headphones and polyvinyl chloride gloves as to prevent personnel from being affected upon insinuating physical contact with RPC-502. In the event of one or more instances are affected through RPC-502's anomalous properties, all RPC-502 instances are to be immediately terminated on sight. 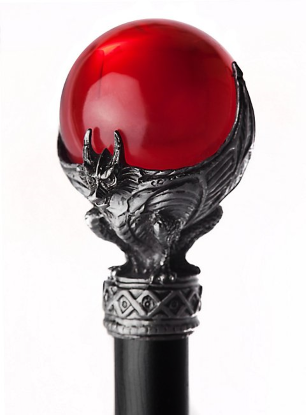 Description: RPC-502 is a long African blackwood staff that is decorated with an ornate silvery fixture depicting a goblin holding a red orb. This fixture has been revealed to be made out of aluminium, and upon closer observation, the orb appears to be made out of tourmaline. Feeling of numbness within the body. Body temperature decreasing to -5°C degrees. Development of sharper forefront canines. Decelerated production of red blood cells. Following initial contact with RPC-502, subjects (henceforth designated as RPC-502-1) will appear to act homicidal and will harm any person, including animals, within their vicinity causing RPC-502-1 to assault and extract blood through any parts of the body. Affected instance's erythropoietin1 will rapidly decrease the production of red blood cells and will heavily influence RPC-502-1 to extract blood through other means, such as exsanguination on organisms that have a circulatory system. Further observations has shown that RPC-502-1 significantly heals injuries at an accelerating rate and is immune to all known strain of diseases, but does not appear to be immune to fungal related diseases. Observation onto RPC-502-1 instances have shown that unaffected subjects may still be affected by the anomalous properties when in contact with RPC-502-1 through biting transmission. Additionally, more than one subjects can be affected through RPC-502's anomalous properties— and does not appear to have any sort of limitations onto how many subjects can be affected. Discovery: Following an increase of unsolved homicidal cases that involved victims having their blood exsanguinated by unknown means within ████████, WA, Authority operatives were dispatched to investigate these cases under the cover as federal agents. Further investigations led Authority operatives to an affected instance of RPC-502-1 when a 911 emergency call was intercepted regarding an unknown individual attack people within the streets. The individual was later identified as RPC-502-1, and was terminated by Authority operatives when RPC-502-1 attempted to harm an operative in the process. 1. The control production of the red blood cells around the body. 2. Attempts to locate the anonymous buyer have been unsuccessful.